Lightweight alder body with 3-ply white pickguard and shielded body cavities It doesn't get any more basic than this. 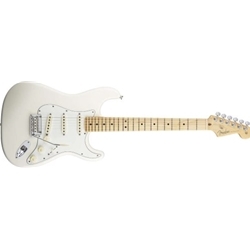 The Standard Series Stratocaster features a lightweight, comfort-contoured alder body which has actually changed very little since the first Strats rolled off the production lines in 1954. However, this new version actually has shielded body cavities for reduced hum and quieter operation than you'd get with a vintage 1950s Strat. A 3-ply white pickguard completes the classic look. Oh, and that low sticker price is pretty nice, too. Vintage-style tremolo with high-mass bridge block While there's no denying the fact that Leo Fender's guitar designs were an amazing blend of art and engineering, it was the erroneously named synchronized tremolo (it's actually a vibrato) that may well have been his most inspired bit of engineering. With it you could bend notes or even entire chords up or down without throwing the guitar out of tune. Even though Fender has continued to improve upon the tremolo, many players simply prefer the look and feel of the original. The Standard Strat comes with that vintage-style tremolo, but it adds a high-mass bridge block for improved sustain and tone. Three standard, single-coil Strat pickups The Stratocaster was the first production line guitar with three pickups, and it's no surprise that this basic configuration is just as popular today as it was in 1954. Your new Standard Stratocaster comes from the factory with three standard Strat single-coil pickups with vintage-style ceramic magnets. Way back in the 1950s and 1960s, players had to carefully fiddle with their 3-position blade switch to get those in between pickup combinations. Don't worry. Your new Standard Strat comes with a modern 5-way blade switch for instant access to all the cool Strat tones. Maple neck and fingerboard with modern C-shape and satin polyester finish Leo Fender wasn't a guitar player. In fact, he got his start repairing radios. So he had no idea that guitars weren't supposed to have maple necks. In time, those blonde maple necks and fingerboards became a Fender trademark, though the company eventually offered rosewood fingerboards on most of its models. This Standard Strat has a maple neck and fingerboard that helps deliver the classic Strat spank and sparkle. In keeping with contemporary tastes, this Strat has a more modern C-shaped maple neck with a satin polyester finish on the back and a gloss finish on the fretboard and headstock.